The luxury facilities offered within Allanvale Apartment enable you to enjoy a relaxing holiday experience combined with flexible living arrangements. The property offers the ideal opportunity to fulfil all your leisure requirements; set in a prime location within the heart of Bridge of Allan, all local amenities are just a short walk away. The accommodation comprises of an open plan lounge and kitchen area, complete with a double sofa bed, and a double bedroom and shower room. All rooms are, like all of our other properties, finished and decorated to the highest standards. The apartment is nice and clean. a lot of things too see and do in the area. if you want to go cycling you better can take a mountain bike than a road bike. The apartment was clean and perfect for two adults. It was quiet at night even with the active pub across the street. Plenty of shopping and restaurants within walking distance. I felt safe walking by myself. There was a minor problem with a lamp that was fixed immediately. Being American, there was a learning curve on using some items, like turning on the shower, but I cannot wait to return. The washer and dryer are small, but efficient. There is no freezer in the fridge, so no ice. All the appliances look new. There are plenty of glasses, dishes, pots and utensils. There are extra blankets, sheets, shelving in the large closet and hangers. A grocery store and post office are within walking distance. The grocery store is open late. I can recommend all the restaurants as very good, but the bakery is perfection. The train station is close by and an easy ride to Glasgow or Edinburgh. The apartment is exactly as pictured and I received my cleaning deposit refund within a couple days. The communication with the rental company was perfect, fast and efficient. The only complaint is that it would have been nice to have a place to sit outside, but the pub across the street can help with that. Lastly, it is at the end of a dead end street so no traffic noise There is a short set of steps that gets you to the main shopping area. It is a small, quiet, restful area with pubs and restaurants close by. Again, I cannot wait to return. 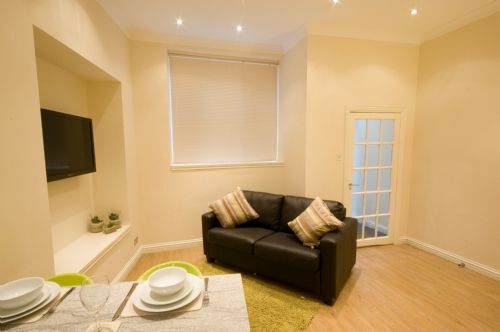 The apartment was situated in an excellent location and was close to shops and all amenities. It was clean and comfortable. One suggestion would be to put in a few freshener in the rooms. Lovely landscape an Shirt distance to Stirling University. We are a retired couple on holiday from Australia. This was a wonderful place for us to spend a week. The apartment itself was exactly as described. Its location was excellent, with many, many attractions located nearby. We explored Bridge of Allan – very interesting. Visited nearby Stirling and Dunblane – so much history. And took trips to Glasgow and Perth as well as visiting The Kelpies. We ran out of time before we ran out of things to do! Would happily return to see more and stay again at Allanvale Apartment. This cute flat is in a perfect location. Walk to everything in Bridge of Allan. Wifi signal was good. Owner and property manager are very responsive if needed. Nicely equipped kitchen. Lots of cabinet space in bathroom to store your toiletries. There is plenty of parking on the street and in the car parks nearby and there is a spot in front of the flat that is sometimes available for parking (but it is not designated for the flat). We never had trouble finding a place to park that was close.